For use indoors and outdoors. Bonds wood, metal, stone and ceramic. 100% waterproof and has an open working time of 20 minutes. Foams to 3 times its original size giving greater coverage. Leaves a neutral colour which can be stained or painted. Gorilla Glue 250ml is rated 4.4 out of 5 by 27. Rated 1 out of 5 by TonyT12 from Rubbish It may stick eventually, but not before it has made a complete mess everywhere. Very difficult to work with. Rated 5 out of 5 by Tradereviewer from Excellent Incredible stuff, I found the water activation works best If you spray with a plant sprayer. Does foam up quite a bit so go easy with how much you put on to begin with. Strength once set though really is incredible. Rated 5 out of 5 by EssexTel from The Best glue ever! I bought this adhesive specifically to glue some walling bricks onto a low garden feature, so I wouldn't have to mix up cement. It did the job perfectly. I also mended broken paving slabs - again a perfect job. Rated 5 out of 5 by Allan B from First time use Bought this glue on a recommendation and wasn't disappointed. It bonds really well and provides a good solid joint. 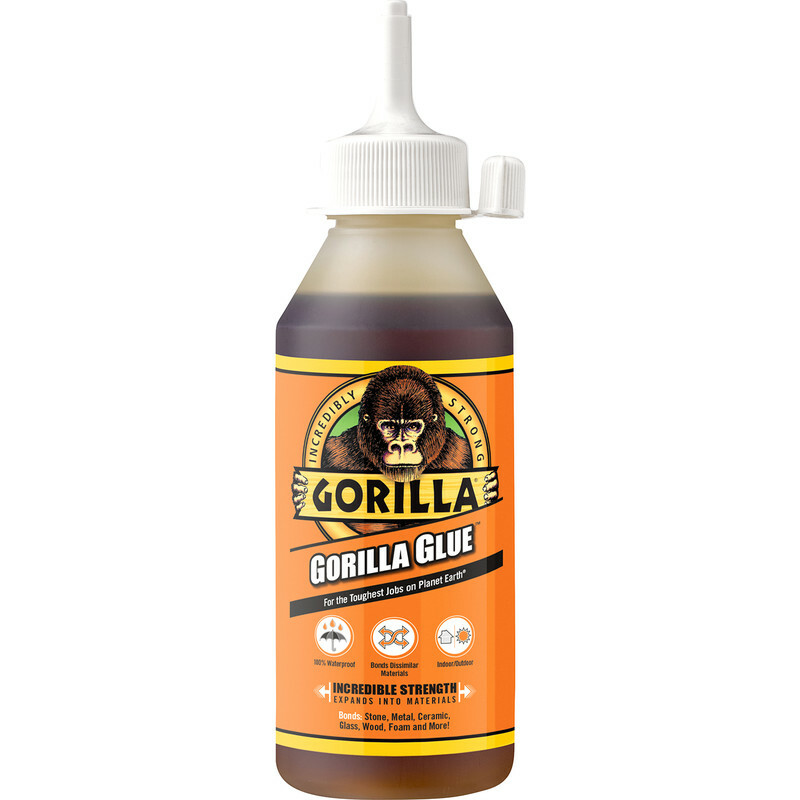 Rated 4 out of 5 by Rob 75 from A good glue I have used Gorilla glue before and found it to be very good and produces a strong bond on most materials. The only negative comment that I have is that once it has been opened & used you have to make sure that all the air is removed from the container, failing to do this the glue will cure in the container and is no longer any good.